The Arthur M. Sackler Gallery’s breadth and mission reflect the vision of its founder in situating artistic and humanistic endeavor within the larger context of cross-cultural understanding. The Sackler and neighboring Freer Gallery of Art together comprise the largest collection of Far and Near Eastern art and antiquities in the United States. I collect as a biologist. . . . To really understand a civilization or a society, you must have a large enough corpus of data. Born in New York City, Arthur Sackler (1913–1987) was the eldest of three sons.Find out more about the Arthur M. Sackler Gallery on the Freer|Sackler website, http://www.asia.si.edu/, and explore their collections at http://collections.si.edu/search/. His parents, Isaac and Sophie Sackler, were Jewish emigrés from Ukraine and Poland who managed a grocery store in Brooklyn. Though not an artist, Sackler’s interest in art was evident from an early age. Sackler fondly recalled frequenting the Brooklyn Museum as a young child, and in high school he studied sculpture with Chaim Gross at the Educational Alliance, a Manhattan social institution dedicated to the assimilation of Eastern European Jewish immigrants.Arthur M. Sackler Foundation, “The Arthur M. Sackler Collections,” accessed December 1, 2016, http://arthurmsacklerfdn.org/the-sackler-collection/. After graduating from Erasmus Hall High School, Sackler continued his studies at the New York University, where he studied art history and English, and at the Cooper Union Art Institute, where he enrolled in night drawing classes. After graduation, he continued at NYU, studying medicine and specializing in psychiatry, a field in which his younger brothers, Mortimer and Raymond, would soon join him. From Psychiatrist . . .
By the mid-1940s, all three Sackler brothers were reunited at New York State’s Creedmoor Psychiatric Hospital in Queens. There they began their research on the biological origins of mental illness. If the causes of mental illness were hormonal and physiological, the Sacklers argued, pharmacology rather than psychoanalysis might be the key to treatment. In 1952, Arthur Sackler engineered the brothers’ joint acquisition of the Purdue Frederick Company, a struggling New York pharmaceutical manufacturer. Under the Sacklers’ ownership, Purdue began producing and marketing a wide array of household products, including the disinfectant Betadine and laxative Senokot, and acquired the patent for a controlled-release technology they called Contin. Arthur Sackler’s business ventures were scarcely limited to drug manufacturing. To finance his medical studies, Arthur had joined a small New York–based advertising agency, William Douglas McAdams. He continued to work for the firm after his schooling and eventually made partner.Grace Glueck, “An Art Collector Sows Largesse and Controversy,” New York Times, June 5, 1983. At a time when major pharmaceutical companies devoted little time to drug marketing, Sackler experimented with bold promotional strategies—full-page advertisements in the Journal of the American Medical Association, radio and television spots, and lavish promotional events for doctors—that have become standard practice in the pharmaceutical industry today. Sackler’s techniques made Valium the most prescribed medication throughout the 1970s and the first drug to net its manufacturer, Hoffmann-La Roche, more than $100 million.Medical Advertising Hall of Fame, MAHF Inductees, accessed December 16, 2016, http://www.mahf.com/mahf-inductees/. By the 1980s, Purdue executives realized that Contin’s time-release technology held special marketing potential; combined with the powerful opioid painkiller oxycodone, Purdue Pharma marketed OxyContin as a safer form of pain medication suitable for far wider use. In the end, Arthur Sackler’s keen business acumen earned Purdue Pharma billions in sales even after his death and secured for himself and his brothers a fortune estimated conservatively at $14 billion.Katherin Eban, “OxyContin: Purdue Pharma’s Painful Medicine,” Fortune, November 9, 2011, http://fortune.com/2011/11/09/oxycontin-purdue-pharmas-painful-medicine/. Fortuitously for Sackler, the vicissitudes of Chinese domestic politics were transforming the market for Chinese objects at the beginning of his collecting career. Following the Communist victory in the Chinese Civil War (1927–36, 1946–50), Mao’s government targeted dealers who had capitalized on decades of political instability to acquire and export antiquities to the West. In an effort to forestall the continued loss of China’s patrimony, the new Communist government confiscated objects and closed the Chinese offices of exporters like the famed C. T. Loo, prompting many dealers to liquidate what stocks they had; they were especially eager to sell to a generation of young, burgeoning collectors.Karl E. Meyer and Shareen Blair Brysac, The China Collectors (New York: Palgrave MacMillan, 2015), 49. Western artists and artisans have drawn inspiration from Asian art for centuries—the imitation and reinterpretation of Chinese porcelain in Delft pottery or of Japanese ukiyo-e prints in French impressionist painting being only two of the most prominent examples. Sackler envisioned a far more thoroughgoing cultural exchange, and sought to promote an understanding of Asian civilizations through analysis of their artistic expression. “I collect as a biologist,” Sackler remarked. “To really understand a civilization or a society, you must have a large enough corpus of data.” Just as one couldn’t “know twentieth-century art by looking only at Picassos and Henry Moores,” neither could one comprehend the Far and Near East only by acquiring objects of exquisite beauty.Thomas Lawton, Shen Fu, Glenn D. Lowry, Ann Yonemura, and Milo C. Beach. Asian Art in the Arthur M. Sackler Gallery: The Inaugural Gift (Washington, D.C.: Smithsonian Institution, 1987), 9. Although the temporal and geographic scope of his interests was broad—encompassing Shang dynasty (1600–1046 BCE) oracle bones from China, Achaemenid (550– 331 BCE) vessels from modern-day Iran, and South Asian temple sculpture from the tenth to the fourteenth century CE—his collection, tens of thousands of objects in all, was variable in quality, containing objects worthy of display as well as those fit for use as study or training material alone.Lawton et al., Asian Art, 14, 21, and 59; Thomas Lawton and Thomas W. Lentz, Beyond the Legacy (Washington, D.C.: Smithsonian Institution, 1998), 94. Stag, Central Asia (? ), first millennium. Freer Gallery of Art and Arthur M. Sackler Gallery, Smithsonian Institution, Washington, D.C.: Gift of Arthur M. Sackler, S1987.119a-b. Seated Ganesha, Hoysala dynasty, twelfth–thirteenth century. Freer Gallery of Art and Arthur M. Sackler Gallery, Smithsonian Institution, Washington, D.C.: Gift of Arthur M. Sackler, S1987.960. Ritual bell (bo) with hooked flanges, Western Zhou dynasty, ca. 1000–800 BCE. Freer Gallery of Art and Arthur M. Sackler Gallery, Smithsonian Institution, Washington, D.C.: The Dr. Paul Singer Collection of Chinese Art of the Arthur M. Sackler Gallery, Smithsonian Institution; a joint gift of The Arthur M. Sackler Foundation, Paul Singer, the AMS Foundation for the Arts, Sciences, and Humanities, and the Children of Arthur M. Sackler, S1999.120.18. Sackler, however, was reluctant to articulate his understanding of Asian civilizations in artistic terms: “A collection must be more than a simple accumulation of objects,” he remarked, but “I’m a lazy man, and I don’t have enough lifetimes to be able to make the points that I want my collections to make.”Glueck, “Art Collector.” Instead, he hoped that his collection would provide scholars with resources to engage in focused scientific and anthropological study. While Sackler regarded himself “more as a curator than a collector,” he had great respect for those with sophisticated collecting ambitions, chief among them a fellow New York psychiatrist, Paul Singer.Glueck, “Art Collector.” Singer’s tastes focused in large part upon rare, small archaeological objects gleaned from digs throughout Asia.Meyer and Brysac, China Collectors, 339–42. Unlike Sackler, Singer did not have the means to acquire prolifically—until Sackler began underwriting his collecting habit with quarterly lump sums on the condition that Singer’s hoard would go to a Sackler-named institution after his death.Holland Cotter, “A Gift Shines Light upon Ancient China; 5,000-Piece Art Collection Tells Some Unusual Tales,” New York Times, September 15, 1999, http://www.nytimes.com/1999/09/15/arts/critic-s-notebook-gift-shines-light-upon-ancient-china-5000-piece-art-collection.html. Sackler happily lent objects from his collection for display and academic study, sponsoring exhibitions at Columbia University in the 1960s and underwriting the acquisition of Chinese paintings and sculptures at Princeton University in the 1970s.Sanka Knox, “Asian Treasures Lent Columbia For Public Exhibit and Research,” New York Times, November 11, 1960; ibid., New York Times, June 25, 1968. He provided flagship donations for new construction at Harvard University to house the Fogg Art Museum’s growing collection of Asian art and classical antiquities. Together with his brothers, Sackler collected funds for the renovation of the Great Hall of the Metropolitan Museum of Art and the construction of its North Wing, which now houses the legendary Temple of Dendur.Paul Richard, “Harvard's Stunning New Face,” Washington Post, October 19, 1985. Building a gallery was not the principal aim of Sackler’s philanthropic or collecting endeavors. Indeed, it was not until the last decade of Arthur Sackler’s life that the Smithsonian first conceived of an extension to the existing Freer Gallery of Art, and only five years before his death that Sackler committed his collection and funds to the project.“Japan to Aid 4 U.S. Institutions,” New York Times, May 2, 1979, http://www.nytimes.com/1979/05/02/archives/japan-to-aid-4-us-institutions.html. In fact, for decades it was widely believed that Sackler’s collection of Asian artifacts would eventually go to New York’s Metropolitan Museum of Art, where it had been stored since the 1960s. Curiously, his long relationship with the Met did not arise principally because of his substantial collection. Rather, museums and other cultural institutions needed financial support for construction and maintenance projects far more urgently than they needed artworks.Robert Hughes, “The Maturing of the Met,” Condé Nast Traveler, September 1991. In this respect, Sackler and his brothers willingly obliged, partially underwriting sorely needed renovation and construction work at the Met throughout the 1960s and 1970s. Sackler’s donations, totaling several million dollars, earned him a hefty tax break and came at a steep cost for the Met, which agreed to devote an entire storeroom to maintain the Sackler collection.Meyer and Brysac, China Collectors, 343. Such negotiation—especially for naming rights—was characteristic of Sackler’s philanthropic endeavors. Where museums lacked objects, he was happy to lend them, but as the landscape of American and global philanthropy shifted to favor donations of operating capital, he had the funds to oblige—a versatility that eventually spawned two charitable foundations, numerous named research institutes, and museums on three continents. Another Museum of Asian Art? By the 1970s, the combination of constraints on the Freer bequest and growing interest and interaction with Asia provided the initial impetus for the construction of an extension to the Freer Gallery of Art. In 1979, the Japanese government pledged $1 million for the construction of a $13 million, two-story annex to the Freer Gallery for hosting loan exhibitions and antiquities not in Freer’s original collection. Korea soon followed suit. Though some wished for more than an extension, without either funds or a substantial permanent collection, another museum of Asian art was unjustifiable.Lawton and Lentz, Beyond the Legacy, 65. That is, until 1982, when Sackler ended years of speculation and pledged $4 million and the core of his collection—some one thousand pieces valued at $50 million—toward the construction of a coequal museum to complement the Freer.Irvin Molotsky, “Sackler Asian Collection Given to Smithsonian,” New York Times, September 16, 1982, http://www.nytimes.com/1982/09/16/arts/sackler-asian-collection-given-to-smithsonian.html. Construction on the Sackler Pavilion, designed by Yoshimura Junzō and completed by Jean Paul Carlhian, began almost immediately. Unlike the Freer’s naturally lit collections, the Sackler was to be housed in a three-story complex underneath the Smithsonian Quadrangle, with a skylight providing the only natural light. Its entrance would face the new National Museum of African Art, which reopened across the quadrangle in the same year.Lawton and Lentz, Beyond the Legacy, 65–68. By spring 1987, construction on the $73 million project was completed and a grand opening exhibition and gala planned for that fall. Sackler did not live to see the museum’s opening: he had passed away that May, a few months shy of his seventy-fourth birthday.Sarah Booth Conroy, “The Opulent Sackler Celebration,” Washington Post, September 14, 1987, https://www.washingtonpost.com/archive/lifestyle/1987/09/14/the-opulent-sackler-celebration/04d93f4f-93cc-492c-8299-7641d066b44b/. Jeff Tinsley, Quandrangle construction, 1984. Historic Images of the Smithsonian, Smithsonian Institution Archives, Image #84-11807-18. Jeff Tinsley, Construction of staircase in Sackler Gallery, 1985. Historic Images of the Smithsonian, Smithsonian Institution Archives, Image #85-6243-09. 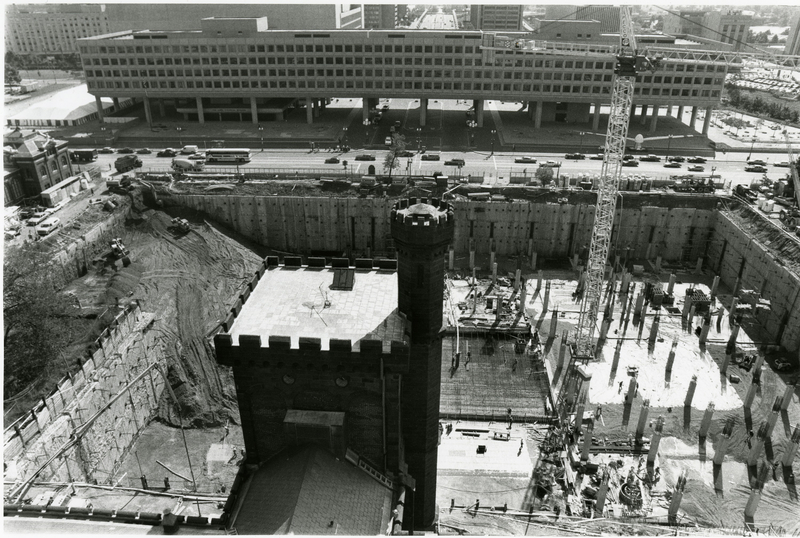 View of construction site with Sackler Pavilion, 1986. Historic Images of the Smithsonian, Smithsonian Institution Archives, Image #86-5103-17. Today the Freer and Sackler Galleries stand side by side on the Smithsonian Quadrangle. Physically connected by design, the two institutions have had shared curators and research staff since the Sackler’s inception.Lawton and Lentz, Beyond the Legacy, 97. But they remain distinct collections with distinctive characters. In the words of Julian Raby, the current director, where the Freer is “almost a temple of calm . . . the Sackler needs to be much more lively, innovative, risky.”Meyer and Brysac, China Collectors, 341. Where the Freer preserves the personal aesthetic vision of the collector who first assembled it a century ago, the Sackler’s breadth and mission reflect the more contemporary considerations of its twentieth-century benefactor, situating artistic and humanistic endeavor within the larger context of cross-cultural understanding. The Sackler’s collections serve as a resource not only for historians of Asia but also for curators seeking to put together a wider array of exhibitions than had previously been possible: critical exhibitions examining art from Asia in its political, social, and religious contexts or showcases for emerging artists hailing from or inspired by Asia. Enabled by Sackler’s agnostic aestheticism, the Sackler Gallery has continued to evolve its interpretation and presentation of Asian civilizations. Reflecting on his life of philanthropy in the arts, sciences, and humanities, Arthur Sackler remarked, “in just forty years modern science has forever altered many of the so-called verities of four billion years; that same science now demands that if we are to survive, we must extend those bonds which, in addition to linking the peoples of the past to the peoples of the present, must create better channels of communication and understanding, respect and esteem, to assure [its] future progress.”Lawton et al., Asian Art, 11. However unlikely it was that Sackler anticipated, at the beginning of his collecting career, the prominence of Asia in a new global order, his quest for mutual understanding established the Sackler Gallery as a constant work in progress.Lawton and Lentz, Beyond the Legacy, 110. Profile by Melda Gurakar, Melissa Rodman, Joy Wang, and Leah Yared, 2016 summer interns.